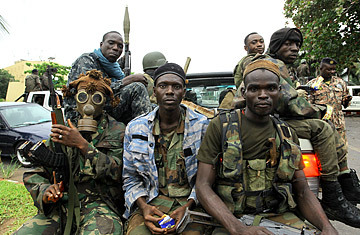 Pro-Ouattara fighters of the FRCI (Republican Force of Ivory Coast) prepare for a "final assault" in front of the Golf Hotel in Abidjan on April 5, 2011. First, the city was frozen in fear. Then came a day of fierce and hot battle, with a scorching chaos. Now, Abidjan, afloat on watery lagoons, is parched, its citizenry athirst yet fearful of stepping out into the streets, where bodies lie uncollected and the smell of death emanates. The showdown between the rival claimants to the Ivory Coast's presidency have brought the country's richest city and de facto capital to a civil collapse. The two men aren't too far from each other in terms of distance. Allassane Ouattara, the internationally recognized winner of a run-off late last year, is surrounded by U.N. peacekeeping troops in the Golf Hotel in a northern district of Abidjan. His opponent, Laurent Gbagbo, the incumbent president, was believed to be in a bunker beneath the official Presidential residence in the Cocody district, just two miles away from the Golf. In Cocody, an estimated 3,000 of the armed youth militia loyal to Gbagbo had surrounded the Presidential residence, putting up a stiff fight against the Republican Army loyal to Ouattara. But at about midday in Abidjan, the spokeswoman for the Republican forces, Affisa Bamba issued a statement saying that it had "launched an assault against Mr. Gbagbo's residence. They have entered the residence. They have been given formal orders to capture Mr. Gbagbo without physically harming him." The speculation, however, is that despite all the effort, Gbagbo may have left his residence days ago and may be somewhere else. Said one Cocody resident of the chaos: "It is absolute mayhem here. There are youths driving around in 4x4s shooting in the air. We can hear gunfire and the smell of corpses is getting worse." If Gbagbo is not found in his residence, the suspicion is that he may be at the Presidential Palace in the Plateau district, which is also in the northern Abidjan, just one lagoon across from Cocody. At the moment, there are about 300 of his loyalist youth militia around the place, apparently part of a 700-man force. But they are said to be disspirited and undirected. They are also very thirsty as the water supply situation is getting worse. The rest of the city is parched and starving too because of the fighting. The pro-Gbagbo militia had been going from door to door knocking, asking for water. But all that is available seems to be the polluted liquid in the lagoons that make up Abidjan, drawn out by people brave enough to head out and fill cannisters and cans. The last time many residents of the capital were able to go out to buy food was Saturday. One small supermarket was secured by three Republican guards that the owner, a hardy Lebanese man, had managed to bring over to protect himself and his shoppers after pulling some strings. Inside, people shoved and pushed desperate to buy anything they could grab. Some had been trapped in their homes for two days. The shelves emptied within a few hours. People have been isolated in pockets in the city. One woman had been trapped in her office since Thursday, unable to leave as gangs of armed men roamed the street below. She survived on of a packet of biscuits and two cans of soda. Unable to wait for a promised United Nations rescue any longer, she ran the two blocks to a more promising location, which was itself falling low on supplies. "This place is paradise," she repeated to the people that took her in and provided her with water and some food. "This place is paradise." Two factors have made this conflict different: the United Nations and the intervention of France, the former colonial ruler of Ivory Coast. In an almost unprecedented action, after a March 30 Security Council authoritazation, several U.N. MI24 helicopters swooped down on Abidjan along with French Puma and Gazelle helicopters shortly beore 8 p.m. Monday. Their targets were Gbagbo strongholds and areas used to store heavy artillery and munitions that had been lobbed at civilians over the past week. From Paris, the Elysée announced that French Forces "have just engaged in action aiming to neutralize heavy arms used against civilian populations and United Nations personnel in Abidjan." The French took control of Abidjan's airport. French patrols have been seen driving through some of the contested areas of town. The speculation is that if Gbagbo doesn't comply with international demands that he give up power, the French may escalate the conflict. But Paris has made it very clear that it is under U.N. orders, and that the actual engagement is now over until a new operation is mandated from on high. Most French activity now appears to be evacuating French citizens and bi-nationals who want to leave to safe zones. The French seem to hope that their presence will have a dissuasive impact on Gbagbo. The government of President Nicolas Sarkozy says there is no combat action at all. Indeed, there is some concern that some French convoys may become targets because of animosity from the substantial pro-Gbagbo segments of Abidjan. Despite the policy of trying to appear above the fray while already having participated in it, French officials had no qualms about which side they were on. "The flare-up of violence against civilians in the past few days made it pretty clear that this totally unacceptable situation of deadlock in the Ivory Coast couldn't go on indefinitely, and that the time had finally come to get it over with," an advisor to one French cabinet member told TIME. "Gbagbo has to go, period. He is the problem, and there's never been any doubt about it." French Foreign Minister Alain Juppé told France Info radio on Wednesday, "Gbagbo has no way out. Everyone has dropped him. I hope reason finally prevails so we can avoid renewed military action." See TIME's special report: "The Middle East in Revolt."